This six week course is an opportunity to draw two life drawing poses in depth over three weeks each. The aim of these two poses is to introduce the student to the art of drawing the life model on coloured paper. In the first pose we will employ red, white and black chalk on a warm yellow buff paper, while in the second we will use just black and white chalk on a blue-grey paper. The sustained pose aims to hone the student’s skills in both close observation and in conceptualising the human form. After establishing a succinctly described contour drawing which conveys both the structure and anatomical landmarks of the human figure, the student will learn to model the figure using the coloured paper as a mid tone. The aim will be to create subtle transitions in modelled form in chalk pencil with the aid of a selection of stumps (coiled paper sticks that can be purchased from most art supply stores). Some prior life drawing experience is highly recommended. 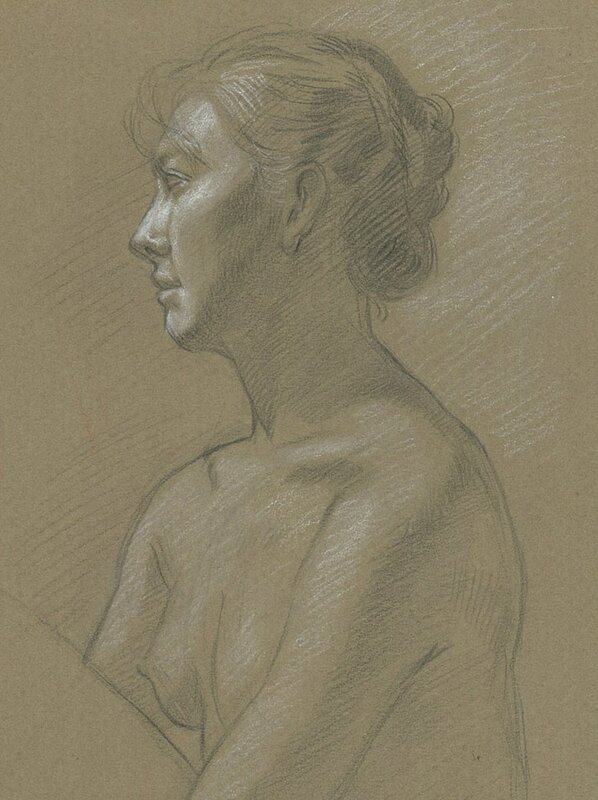 First and fourth class – Aim to establish a close to finished contour drawing of the pose. The teacher will assist the students in understanding the major masses of the figure, where the weight of the body rests in relation to the pose and with signifying important anatomical landmarks. Second class – begin the process of modelling in red chalk, with the light source on the model as a partial guide. With the teacher’s guidance, a greater emphasis will be placed on conceptualising and inventing a light source that manages to describe the front and side planes of the human form. Second and Third class – white chalk will be introduced to convey the higher values. Black chalk will be introduced to emphasise the point at which the form turns from a front to a side plane, or/and into shadow. Fourth class – using black chalk in the former capacity red chalk was used to model the figures form. Fifth class - use white chalk with a much greater emphasis on the aid of the stump to develop transparent layers of hatched chalk marks in the higher values. Sixth class – continue the subtle methodical approach of observing, interpreting and modelling the figures form. Oil based red, black and white pencils (make sure the chalk is oil based). Two (or preferably a selection) of buff and blue-grey sheets of acid free paper (ask your local art supply store what buff paper is if you don’t know - they will!). At least three paper stumps, for black, red and white chalk.